Above: wouldn't it be nice to have people attending you when you are sick at home? I would rather they clean my house while I slept. There is an entire educational training involved in caring for a sick family member at home. Attendees must be clean, dressed cheerfully, able to make a bed, make nutritious soups, and many other things. This kind of training was included in our Home Economics classes of the 1950's. We learned how to load up a bed tray and how to keep a home patient comfortable. A couple of days ago I felt myself coming down with something but fought it off until it finally got me. 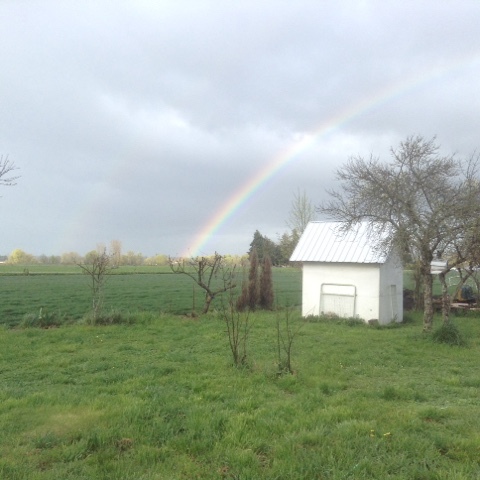 Just before my brain and body were strongly suggesting complete bed rest, Mr. S., who saw me slightly pale in the face decided to catch me while I was still upright, to take a photo of this double rainbow behind the tool shed. It isn't very visible but he always likes a picture of a rainbow. This is the last thing I did before going under cover! 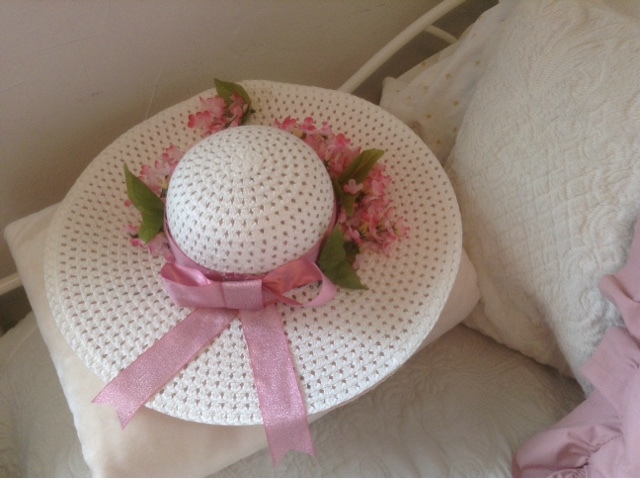 The day before I got really sick, I was busy with my hot glue gun embellishing a plain straw hat. I made it to wear with this dress, which I also made, but it has been too cold outside to model it, and my photographer wasn't here. 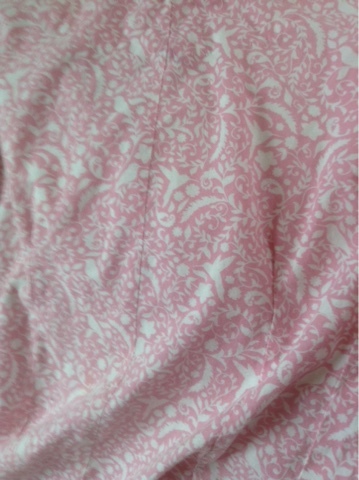 I like the pink on white print of this cotton fabric, of birds and flowers. 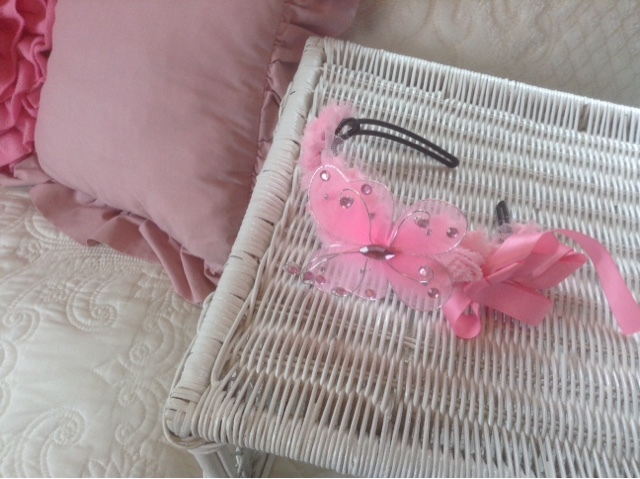 Headband, ribbon, or an elastic bandcan be added to keep it tied down, which is minimal cost. What I really wanted was this hat, but it was $200! I think it is nice that Ashro catalog has a category called "Church Clothes". I didn't even bother to ask Mr. S. about it, because he would have said ....YES. 46 years ago he promised if I would marry him he would do everything he could to make me happy, so he always says "Yes" to the most outrageous things, even if he can't do it, even if I wanted a trip to he moon....so, like many women married to this kind of man born in the previous century, I have to watch what I ask for. I'm sure you know the problem with generous men! My solution was to make a hat for $6 but then when I showed him the amount subtracted from $200, and suggested he owed me the remainder, which I supposedly "saved", he couldn't come up with the money. For the less mature who peek into this blog once in awhile, you need to know that long-married couples settle into a comfortable humor between them, which sometimes the young are critical of. For this reason I will tell you the hat/money incident was all part of our comfortable banter between us. WhenI tell Mr. S. I "saved" him an expense by making something myself, he then looks for the "savings" somewhere and we joke about how much he owes me or I owe him, but we both know it is all the same. Sometimes Mr. S. will notice a tea cup and wonder why he had not seen it before. I will tell him that HE bought it for me, that day he sat in the car waiting for me in an old town where he stopped so I could get out and walk around. The truth is, he really DID pay for it, but it is our special humor. Other times he will tell me to go get myself a birthday or anniversary gift, and days later notice something in the house, such as a small lamp, a new spatula, etc. I will remind him it was his anniversary gift to us and he will say he can't remember getting it. But this is our special humor. I've had people become very critical over things like this because they sometimes develop a set of rules for others to live by, and according to these rules, we have to be serious all the time. More about Mr. S. at the end of this post. I have been so very ill (I won't describe the symptoms) that Mr. S. remembered some time ago when he had a similar illness, his natureopath gave him a remedy on the phone. He said to take a tablespoon of sauerkraut juice, followed by two tablespoons of tomato juice every twenty minutes for two hours and call him in the morning if he was still sick. He never had to make the call. Mr. S., ever the gallant hero, decided to save my life, so he got his jacket on, braved the driving rain in the dark as he opened the car door, drove to the grocery store at 8 pm and found the two ingredients. This is normal for Mr. S., since he had lots of practice back in the day when he would willingly go to the store any hour of the day or night, after I had a baby or needed something for a meal the next day. Once home, he set me up with little glasses of this remedy on a tray, so I could just take it every twenty minutes. Regarding the sauerkraut juice and tomato juice, one of the ingredients does one good thing, while the other ingredient does something else. I will let you look it up on the two links I have provided with these pictures. The concoction was not too bad when using the tomato juice last, as it is so much more pleasant to the taste. The next day I was rather enthused to wake up and see it was daylight at 7 in the morning...I felt a little better and was looking out the window and at the clock. But then I saw on my phone that it was 7 pm instead of a.m. and I was so disappointed to realize I had slept all day and it was evening when I woke up. Of course I was feeling somewhat better and I was back to talking Mr. S.'s ear off on every known subject and some unknown. He was happy I felt better and even happier I went back to bed to sleep off that last bit of stinging sinus pain and stomach pain. 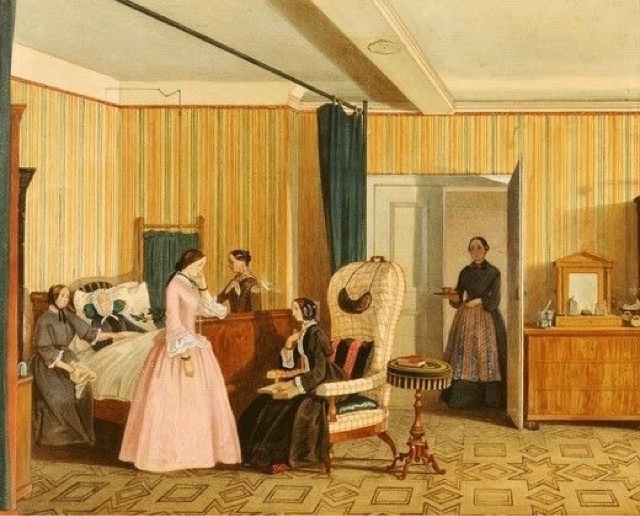 There is nothing worse than being bedridden, too ill to get up and change anything, looking at things in disarray and hoping to live long enough to get it all in order so my children won't be burdened with it. Mr. S. is not in the least worried. He says we should let the children go through all our old boxes of papers and messy drawers of pens and pencils, because that is what we've both had to do in regard to our own parents. He thinks it should be a family tradition. Mr. S. never worries about anything. I, on the other hand, can always find an extra supply of adrenalin to aid me in finding something to feel urgent about, even when I am sick. My room has become a temporary storage area for boxes of things we need to go through. While I lay sick in bed, all I could think about besides the pain, was how I needed to get well enough to sort out those boxes and make the room look more like a bedroom than a storage shed. If medics ever have to come and aid one of us as we lie sick in bed, will they see two old people sleeping in a storage room and report us to social services? Would they remove us from our own house and accuse us of abusing old folks? I think the horror of it made me take the sauerkraut juice a little more willingly! Suggested get-well foods: The homemade garden vegetable blended soups made with the little blender you put directly into the pot of soup, always help me when I am sick. For some reason, however, they taste much better made by someone else and brought to me on a tray. It has taken 3 days but I am feeling better, and still using the sauerkraut juice and tomato juice. However I believe you should stay in bed an extra day and not get too active right away. I had to cancel a few things but I am going to be in bed one more day just to be sure before I plough headlong into life again. In a saucepan, Cook 1/4 cup chopped onion in a tablespoon oil of your choice, until the onion bits are clear. At this stage you can add ground meat if you are including it. Then add 1/2 cup peeled, chopped red potato, 1/2 teaspoon each dried cilantro, and parsley or Italian seasoning. Cool until meat is broken. To this, add a teaspoon RealSalt or Pink salt, Australian salt (any kind of mineralized salt) and 1/2 teaspoon white pepper. Stir with fork to distribute the ground meat. Add shredded fresh cabbage or whatever additional vegetables you like. To this, pour in about two cups hot water and bring the soup to a boil on medium heat until all ingredients are soft. 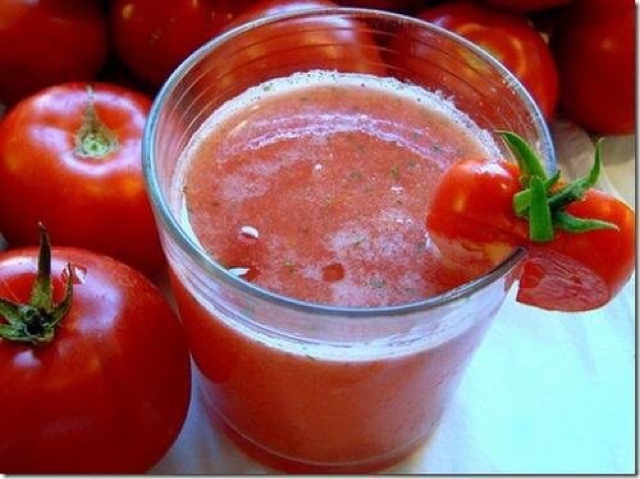 Add the tomato juice and cook until you think all the flavors are well blended. You can also make dumplings to add to the boiling soup, using any recipe you have. This makes all the ingredients in one pot, making less to clean afterwards. You can soften the soup a bit by using your old fashioned potato masher. I don't recommend blending this soup, as the flavor is better when there are still bits of recognizable ingredients. We ate this so fast I wasn't able to get a photo but will try it again another time. 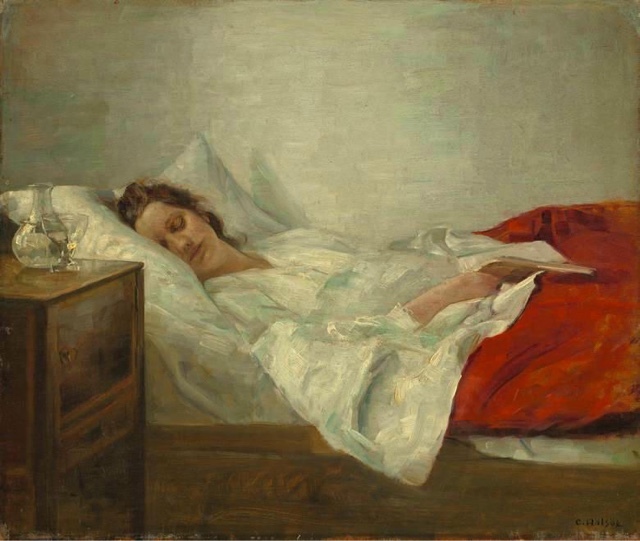 Take good care of your health, Lydia...even during illness you write such delightful posts. 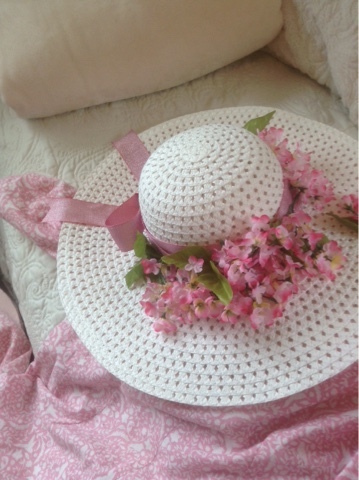 Would love to see you in your pretty dress and hat when you get better. I think your pink ensemble looks positively charming! I'm sorry you've been ill. 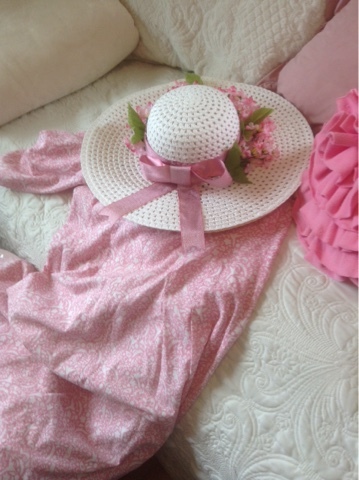 Your new dress and hat are very pretty. Thank you. The pain os gone, and I feel sleepy. By the end of the week I hope to feel normal. I hope you are feeling better today, Lydia!! Hope you're feeling better now Lydia. . sorry to hear you were so ill. . .
For a really healthy soup, omit the butter, and the salt, and the meat and add in their places lots of fresh green leafy vegetables, peppers, zucchini. You'll feel so much better not ingesting those acidic ingredients. . which leave bad residues in your body. 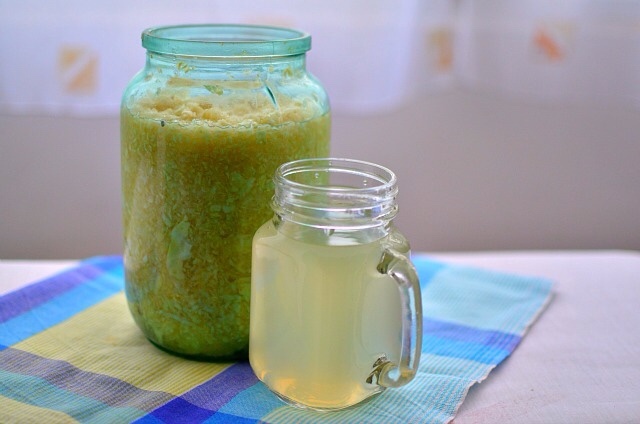 Or, get yourself a little juicer and make fresh green veg juice daily, if possible. Your body will thank you for it. . 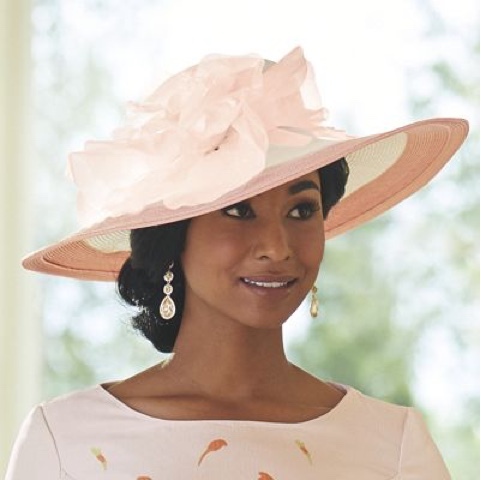 Your hat and dress are lovely . . can't wait to see them modeled. Your Mr. S is quite the little dear isn't he!! You're very lucky. .
Oh dear, I am so sorry that you are sick. We had something similar at our house in February, but unfortunately both my husband and I were sick at the same time. That rather complicates things. That was only the second time it happened in 57 years. Usually we are able to take care of each other. I had a Red Cross Home Nursing course in high school that taught everything from proper hand washing to taking care of a bedridden invalid. I have found the information very useful in my long career of being a housewife and mother. I wish I still had the book for that course! Hope you are better soon! You are thoughtful, indeed, to give us such a nice post during your time of illness. The dress and hat are pretty, and the rainbow picture is spectacular! I have been sick for months with this pregnancy, my third. My previous two brought on nausea for the full duration of the pregnancy, but this one was far worse. For the first two months, I was bedridden, barely able to roll over in my own bed. During that time, my dear sweet husband did all the housework, cooked all the meals, organized the homeschooling, ran all the errands, and took care of me. It was like he was a single father, who also had the burden of taking care of an invalid on top of that. He was also working hard on a business plan to start his own company at that time, and to top all that off, he has several medical issues himself that make things difficult. Granted, the kids' socks were mismatched and everyone ate a lot of oven-ready meals during those long dark weeks, but we all came out of it happy and well cared for. I'm seven months pregnant now, and still weak and ill the majority of the time, but at least I'm able to sit on the couch and direct the children moreso now than I was before, which is a big help for him. So I know what you mean when you describe Mr. S -- I have a wonderful husband like that and I praise God every day for sending me him. Mr. S is such a sweet man! You have a real prize. Called to Lead or to Serve?